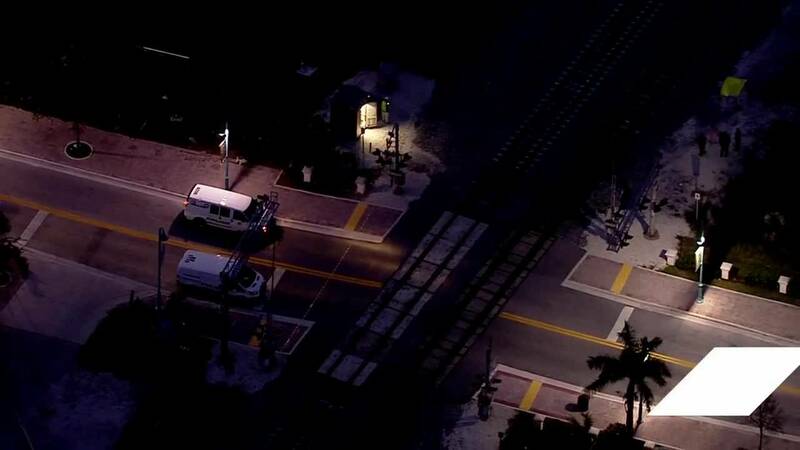 BOYNTON BEACH, Fla. - A 51-year-old man was killed by a Brightline train Wednesday in Boynton Beach, police said. It was the second time someone has been killed by a Brightline train in Boynton Beach in less than a week. Jeffrey King was riding a bicycle when he was struck by the train about 4:30 p.m. in the 400 block of Ocean Avenue, Boynton Beach police spokeswoman Stephanie Slater said. King rode around a safety gate and crossed the tracks in an attempt to beat the train, Slater said. A representative for Brightline said Wednesday that the company was cooperating with the investigation. "Brightline continues to reinforce awareness and education," Brightline said in a statement. "It is critical that the public remains attentive when near any active railroad, always obey the laws and respect the safety devices that are in place to protect the public. Never try to beat a train." According to its website, Brightline canceled several trains after the accident, but the company resumed service about 7 p.m.
Cindy Sumlin owns the East Ocean Cafe near the tracks where King died. She said that she surprised by how many people don't obey the signals. On Friday, a Brightline train struck and killed Melissa Lavell, 32, near Northeast Sixth Avenue and Boynton Beach Boulevard -- a day before the train line debuted its limited service between Fort Lauderdale and West Palm Beach. Like King, Lavell went around a safety gate and crossed the tracks as a train was coming, police said. A woman was struck in July in Boca Raton in an apparent suicide, and another woman was killed in Deerfield Beach in November. The train, which can travel at speeds up to 79 mph, will begin service to Miami later this year. The company plans to eventually connect its South Florida stops to Orlando. Meanwhile, Sen. Bill Nelson, D-Florida, wrote to Transportation Secretary Elaine Chao on Wednesday, requesting that the Department of Transportation investigate the Brightline accidents. "In Florida, we have seen the challenges of addressing grade crossing safety, where according to 2016 data the state is in the top 10 for fatalities and collisions," Nelson said. "Tragically, this trend is continuing with two recent fatalities in Boynton Beach involving the Brightline high-speed train." Last year, state Sen. Debbie Mayfield, R-Melbourne, proposed the Florida High-Speed Passenger Rail Safety Act to address safety concerns about the Brightline service. The bill would require that "certain railroad companies to construct and maintain fences under certain circumstances." The bill is still being considered in the Florida Senate. Brightline has said that its system meets or exceeds Federal Railroad Administration and state guidelines. However, Brightline has also said it is willing to work with municipalities on adding to fencing around tracks in high-traffic areas, citing its work with the cities of Delray Beach and Oakland.